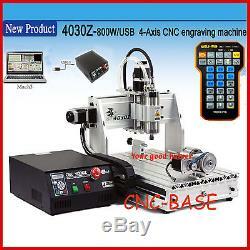 Upgrade USB port connection 4axis CNC Router 3040 220V&110V with 800W spindle & 1.5KW VFD. Upgrade new version can match windows-XP, 7. But only USB2.0 port match. New upgrade USB model can work with laptop. 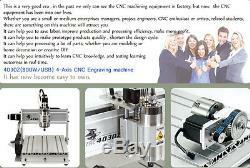 Upgrade with Spindle can be controlled by mach3 software. 80mm chunk rotary axis 60mm in-diamater. 1pcs 4axis USB port controller box. 1pcs rotary axis and tailsto ck. 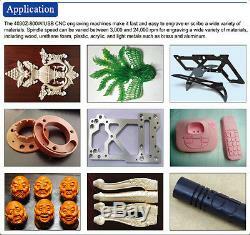 1pcs water pump for cooling spindle. 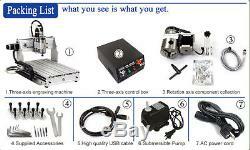 1pcs tool b o x and tools. 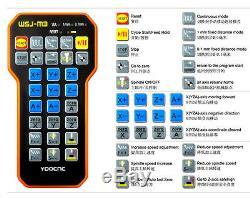 Download link for mach3 software and machine manual. 2, Input the M3 in Mach3, the spindle will turn on, and input M5 will turn off, and input S15000 the spindle will work at the speed of 15000RPM. 3, and in the toolpath. You can add M3, S18000 in the first line. And add M5 in the last line. The spindle will work at the speed of 18000RPM and will stop automatically when finishing working. PRODUCT SPECIFICATIONS (all are true pictures). Note: the rotary axis has been upgrade to the bigger and more precise one by below. Your satisfaction is our first priority. We will take care of the cost to send the replacement item to you. The item "USB four 4axis 3040 800W cnc router engraver engraving milling carving machine" is in sale since Tuesday, September 8, 2015. This item is in the category "Business & Industrial\CNC, Metalworking & Manufacturing\Woodworking Tools & Supplies\Equipment & Machinery\Routers".